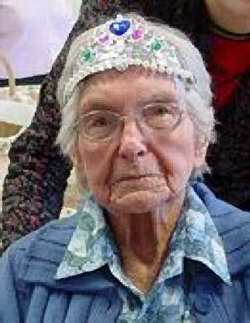 Myrtle Pipkin Johnson, 100, of Port Orchard died July 13 at the Washington Veterans Home in Retsil. She had been a resident there since 1977. She was born in Dinuba, Tulare, Calif., to William Maxey Pipkin and Mary Hope Ramsey, the eldest of their seven children. She was raised on a farm worked by the entire family and rode her bicycle four miles to school each day. As a child, she traveled with her father from California to Oklahoma and back to purchase mules which he sold to the Apache tribes in Arizona for food. She graduated from Bakersfield High School in Bakersfield, Calif. She married Sanford Edmund "Ed" Lafayette Ives on Sept. 11, 1917. They had two children. Her second marriage to Al Landers, a musician, was in about 1942. She married a third time to Harold Mead Johnson in 1949. He preceded her in death on Oct. 2, 1984. Mrs. Johnson built the first adobe house in Bakersfield. She went on to build four more homes. She also traveled the United States with her husband, Harold, during his career in the Navy. Later in life, she enjoyed volunteering at the Washington Veterans Home for various social, recreational and community events. Her life wasn't easy. She'll be remembered for her "indomitable" spirit that carried her to the age of 100. Survivors include three of her sisters; her children, Ellen Ives Anderson of Mojave Valley, Ariz., and Edmund Harold Ives of McArthur, Calif.; six grandchildren; 12 great-grandchildren; and over 12 great-great-grandchildren.